Time for a new challenge at Sketch Girl. This month our sponsor is Perfect Presentation! The winner of the challenge will receive a Perfect Presentation template of your choice. I flipped the sketch & instead of using circles in the corners I used triangles. I used Papertrey Ink Cardstock & Patterned Paper, Ink, and Stamp. 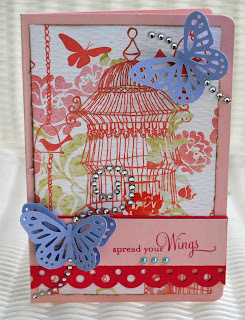 I used Basic Grey Patterned Paper and Chipboard, Prima Bling, and my Cuttlebug plus a Quickutz Embossing folder. I inked over the embossed paper with Martha Stewart ink to make the polka dots stand out. Our Guest Designer for January is Laurel Seabrook. Hope everyone is staying warm. The snow is flying outside my window! We've already got at least 4 inches with MUCH MORE to come. So if you are snowed in (like me) you'll have plenty of time to craft! 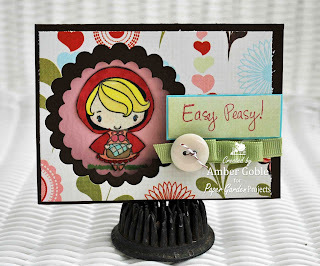 Be sure to leave the link to your card in comments on the Sketch Girl Blog! Paper Garden Projects "Pulling On Your Heartstrings"
Welcome to Paper Garden Projects "Fourth Friday Fun" Challenge. Now if you are a stickler for being correct, you know this is the fifth Friday...but who's counting? This months challenge is super easy and super fun, plus there is an amazing prize pack for the winner! 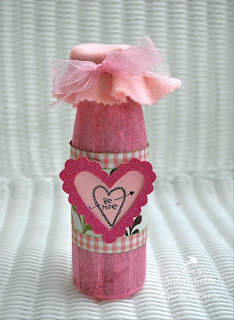 Our challenge to you is to create a Valentine or love themed project that includes ribbon. And if your projects also includes buttons, you will get a double entry! You have till midnight (EST) of Friday Feb. 5 to add a comment to the Paper Garden Projects Blog Challenge post (click the name to follow the link) with the link to your project. We will draw one random winner for the prize. It must be a newly created project for this challenge - but feel free to combine this challenge with any other ones out there. We'd love to see all the art you care to share, but each person will only be entered in the random drawing once (well, twice if you have ribbon and buttons). The winner will be drawn randomly and announced the following Saturday. 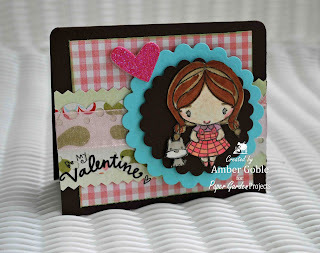 I used the Hearts Bloom Kit for both of my creations and the cutest set of Anya stamps called Signature Girls Cling Stamps made by The Greeting Farm. They are available at Paper Garden Projects. 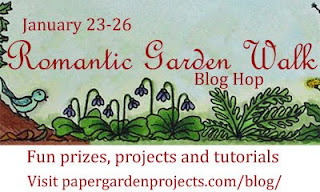 Be sure to play along at Paper Garden Projects for your chance to win the beautiful Hearts Bloom Kit! I am such a ribbon addict! I feel like it's a must on every project I create! So this week's DCRU challenge is perfect - Ribbon! 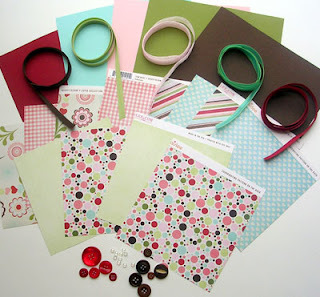 Make a project, LO, or card and use ribbon! Easy peasy! I love the new Mays Art ribbon at the Die Cuts R Us store (click to see the entire selection at DCRU). It is so easy to twist and turn to make the perfect bow. And check out Dawn McVey's bow tying tutorial if you need extra bow-tying inspiration. This card was so fun and simple to make. Everything highlighted in pink is available at the DCRU Store. I used Prism cardsock as my base. Then I layered 2 different Basic Grey patterned papers from the Origins collection. I LOVE this collection of paper, such great earthy colors. I added BG Origins matching chipboard tree limb. Then I added my May Arts ribbon. I used a PTI stamped sentiment and added 2 brads. I inked all the edges of my paper with Martha Stewart ink. 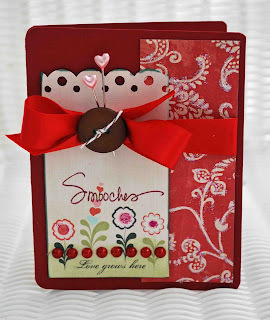 Visit the Die Cuts R Us DT blog to see the DT's beautiful creations. Hi and welcome to PGP's Romantic Garden Walk! 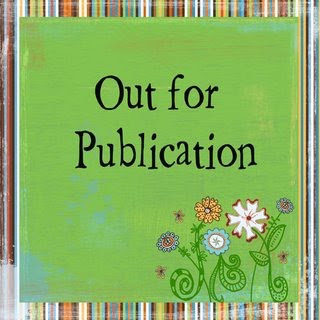 So glad you've joined us for the blog hop. If you're just stopping by, visit Cathy's Blog to begin the hop. If you are already taking part in the hop, you should have arrived from Tracy's Blog. Now sit back and enjoy a romantic stroll thru the garden and be inspired by the design team to create your own Valentine Treats. While you visit, subscribe to each Gardener's blog and take note of each designer's name and their Romantic Word in their blog post. Once you finish your garden tour, send an E-mail to custserv@papergardenprojects.com with the list of designers and their Romantic Word. The contest runs from January 23-26. There's a beautiful Penny Black stamp set just waiting on the winner of the hop! You simply start with a clean glass surface. Cut your tissue paper in strips, approximately 2 or 3 inches wide. 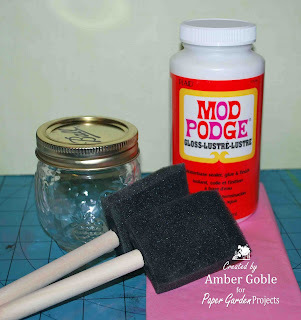 Then you take Mod Podge and paint 2 or 3 inch section down your bottle. 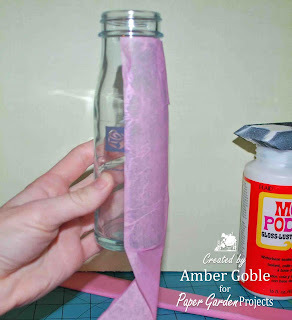 Adhere the tissue paper, then paint a section on the bottom of your bottle and adhere the paper, and do the same for the next side. Keep the strips of tissue paper long so you can do both sides with the same piece. When I got to the top of the bottle I trimmed the tissue paper for a perfect fit. I took a clean sponge brush to smooth the tissue paper to the bottle. I kept doing this until the bottle was covered and I reached the desired color and thickness of tissue paper. 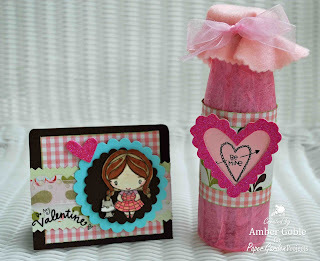 Then I embellished the bottle with the Hearts Bloom Kit from Paper Garden Projects - a beautiful kit with ribbon, buttons, cardstock, and patterned paper. 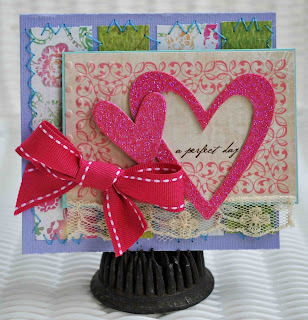 I added a Making Memories Chipboard Heart, felt for the topper, and a Melissa Francis Rub-On. For my card I used the Hearts Bloom Kit & an adorable Anya Stamp that is also available in the Signature Girls Stamp Set also at PGP! I used my Copics, MS Scalloped Punch, Making Memories Chipboard, Melissa Frances Rub-On, and Cuttlebug w/Spellbinder Nestabilties. And for the finished gift set. All you need to add are some sweet treats to your bottle and you have a quick and unique gift. Now for my romantic word: LOVE. Next stop on the hop is Lorelie's Blog. 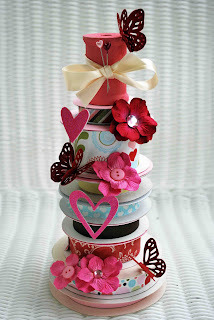 And Paper Garden Projects is having a Blog Hop starting Saturday with a "sweet treat" for the winner! 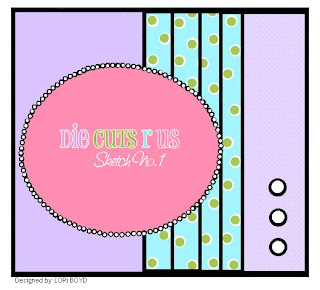 Today is a special challenge at Die Cuts R Us- our first Sketch Challenge! Our first sketch was created by DT member Lori. First of all I started by flipping the sketch. Then I used paper, buttons, and bling from the DCRU January Card Kit. I then used American Crafts Stamps - available at the DCRU Store to stamp my tree branch, birds, and sentiment. 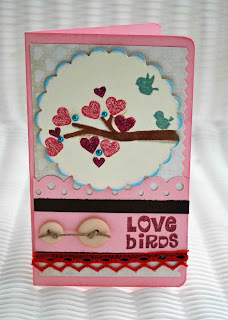 I used Papertrey Ink heart stamps in place of leaves on my tree. I went over my hearts with Stickles to add some shine. I also used my Martha Stewart Scalloped Punch, Cuttlebug & Spellbinder Nestabilities, and vintage lace from Etsy. 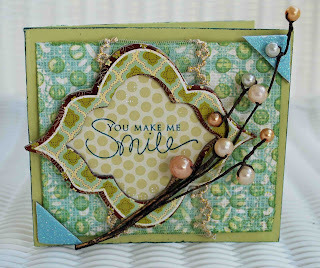 Visit the Die Cuts R Us DT Blog and check out the DT's beautiful creations this week! Time to ring in the New Year with a new challenge from A True Friend's Challenge Blog. Challenge #62 is "What magazine/book title reminds you of your pet?" and make a creation around this theme. Be sure to leave the link to your project in comments at ATF's. I used the Title "The Lucky One", a book by Nicholas Sparks (I just love his books!). This title is perfect because of my relationship with my BFF Ms. Gracie Goble. She's my baby girl, a little fluffy cotton ball who follows every step I make and is my most loyal friend. We got her at our local animal shelter a few days after we returned from our honeymoon. She had been there for at least a month. Her fur was so matted when she arrived that they had to shave her and she only weighed 8 lbs at 10 months old. Now Gracie is 6 yrs old and weighs 21 lbs. She is a butter ball. The picture in this LO was the Spring after we got her. I'm not sure who "The Lucky One" is, me or her. I guess we're both lucky we found each other. I used Bo Bunny Patterned Paper, Prima Flower, Colorbok Cardstock, and American Craft Thickers. Visit A True Friend to see the DT's take on this challenge! I'm soooo excited to FINALLY share the new Sketch Girl Challenge #10 with everyone! The sketch is amazing and fun, great to add to your idea notes for future cards. 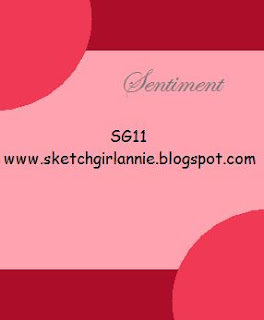 All you have to do is design a card from Sketch #10 and add your link to the comments at Sketch Girl. The winner of the contest will receive a prize from Perfect Presentation - Leigh Anne Baird's new line of affordable templates that you print, cut, score and assemble. All template purchases come with instructions that include photos to help with assembly and adhesive placement. Measurements and/or templates are included to make cutting decorative panels quick and easy. They are available for purchase at the Wildflower Patch so go check them out! 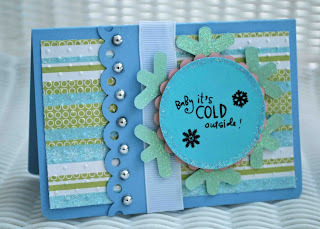 I used the fabulous January Card Kit available now at Die Cuts R Us (paper, buttons, ribbon). I added a stamp from Papertrey Ink. Used my Martha Stewart Scallop punch and some bling. I shined everything up with Stickles. And 2 little heart stick pins topped things off. It's Tuesday and that can only mean one thing, a new Die Cuts R Us Challenge! This week's challenge is to make a project using leftover Christmas/Holiday papers. I'm sure you all have leftovers right now from cards and pages! I used leftover patterned paper from my scrap bin. I layered it onto a piecie of PTI Cardstock after running it thru my Cuttlebug with the Swiss Dots Folder. I used my Martha Stewart Scallop Punch for my border. I then layered a Scalloped Circle I made with my Spellbinder Nestabilities onto a glittery snowflake that I got in a card kit at Wal-Mart several years ago. I added a circle Marvy Punch to the top of this with a Melissa Frances Rub-On. And I added a little touch of bling and Stickles for some shine. Now it's your turn! Be sure to link your project to the DCRU DT Blog and don't forget the Design Team Call going on now. Just had to share my fun news. 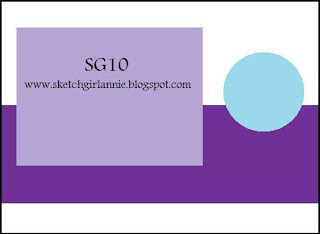 Leigh Ann - the owner of Sketch Girl, invited me to join the Design Team! I'm so excited. I was a Guest Designer in the Fall and just love their sketches. Plus my Mom is also on the DT, how fun is that? Sketch Girl is kicking off the new year on January 15th with a new sketch! Challenges, Challenges, & More Challenges! It's snowing AGAIN in Kentucky! So I've been out sledding with my nephew and visiting the barnyard. But I've also had time to be creative! I've got 2 cards for 3 challenges. For this card I used Papertrey Ink & Core'dinations cardstock and Melissa Frances Patterned Paper. I added a Melissa Frances Date sticker and inked its edges. I used Papertrey Ink's Ocean Tide and Cream ribbon, Papertrey Ink stamps, and Martha Stewart punches. I'm so addicted to my MS butterfly punch. 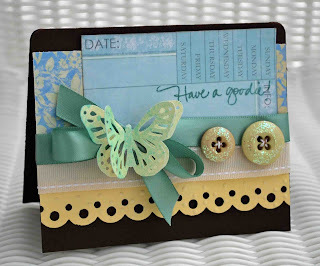 After I had layered my butterfly I used Tattered Angels Glimmer Mist to add a little blue to the cream paper. To finish this card I added 2 buttons and glittered them. I flipped the sketch to make my card. My Cardstock and Stamp is Papertrey Ink. 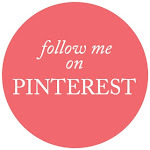 I added vintage goodies from Etsy (lace, ribbon, and image). And I used my Martha Stewart Scalloped Punch. I used Fancy Pants Rub-Ons. This little card was fun to make! And Die Cuts R Us is having a Design Team Call. If you are interested just visit the Die Cuts R Us DT Blog for details. Die Cuts R Us is kicking off the New Year with a super new challenge. It's a color challenge! See the pretty colors in the challenge banner overhead and the DCRU Logo to the right? Make a project using these colors and leave your link at the DCRU DT Blog with Mr. Linky! I built this card according to the color guidelines around this beautiful Basic Grey Patterned Paper. It is called Windermere and it is part of the Basic Grey Porceline Collection. 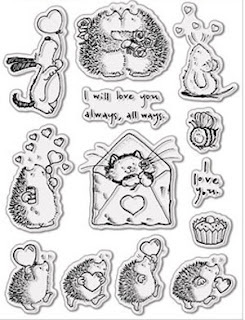 You can purchase the entire Porceline collection with matching brads & buttons at Die Cuts R Us. For this card I used Papertrey Ink & Core'dinations Cardstock. I layered on my Basic Grey Patterned Paper. 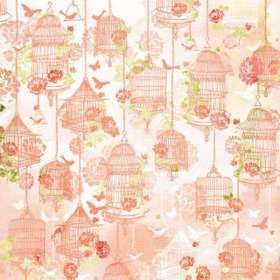 I traced the little bird cage with a Sakura Glitter Pen. I used my Martha Stewart Butterfly and Scallop Punches. I stamped my sentiment using PTI ink and stamp. And I added a little bling. Be sure to stop by the DCRU DT Blog and check out all the beautiful creations by the DT! My first post of 2010! I think it's so exciting to start a new year. Leave all the extra baggage of the past year behind with a new beginning. I can already tell the days are getting longer and I'm loving the extra daylight. Won't be long till the little trees start blooming and frogs croaking...ok maybe I'm getting ahead of myself - it did snow today! I used PTI cardstock for my card base. Then I added strips of Melissa Frances and My Mind's Eye patterned paper. I zig zag stitched around each of these. Then I added a Webster's Pages card that said "A Perfect Day". I simply framed the saying with a chipboard heart by Making Memories. I added a bow and some vintage lace for the finishing touches. Hope everyone has a terrific Sunday. We have Church in the morning then spending time at the barns, followed by homemade vegtable soup for dinner and kicking back to watch some football!